A small lighthouse with conic top and red windows. Next to it is a small hut. All sitting on a teardrop shaped crystal base. 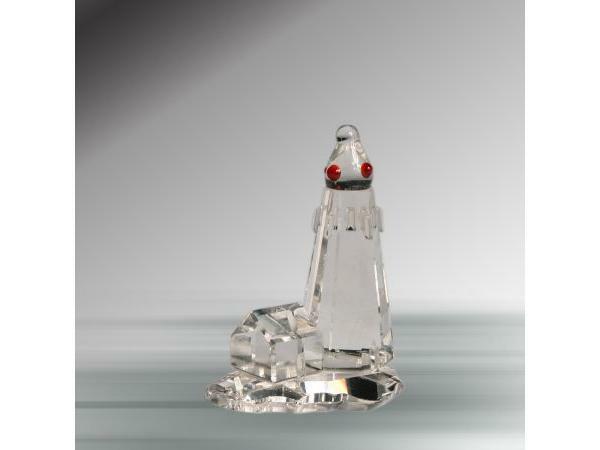 This Small Crystal Lighthouse is 100% handcrafted of 24% lead crystal. Lead crystal is made from a mixture of sand, potash, and lead oxide. Crystal offers a striking harmony of colors and light, creates amazement by its brilliant reflections and displays the colors of joy to crystal lovers. Measures approximately 1.875 inches at its longest point.